I have started adding a little bit more structure to our ASP.Net MVC project to start separating out the various components.Â We needed to do this to create a framework that allowed multiple people to work on the application and modularize the code to make it more maintainable. Separate the various components of the website in to partial views to allow them to be designed independently, shared between views, and to simplify the layout of the page.Â This is very similar to how controls work in WebForms. Select the view directory to place the partial view, “Common” for those shared between different controllers, or in the View folder related to the controller, and select “Add->View”. 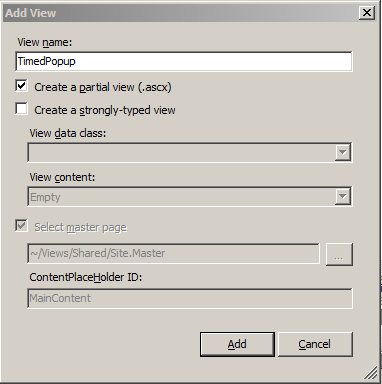 Give the view a name, select “Create a partial view (.ascx)”, and “Add” the partial view. Copy the HTML layout in to the partial view. Insert the Partial View in to the Views where it is needed. Namespaces can be used to separate the code in to different separate blocks to avoid naming conflicts. The scripts directory is segmented in to a hierarchy that maps to the namespace.Â Add the component under the appropriate directory.Â In this case add “TimedPopup.js” to “~/Scripts/S1S/UI”. Create the appropriate variables, being careful not to destroy previous objects.